DOUG BEEKMAN - FURY OUT OF TIME COVER PAINTING. 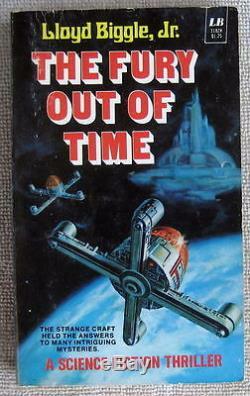 First published in 1975 by the Leisure Books division of Belmont Tower Publishing, the cover art for Fury Out of Time has been republished a number of times since, in Starlog publications, SF Age and elsewhere. 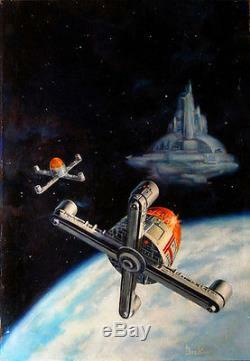 Although I'm probably best know for fantasy, I did several dozen fine SF cover paintings between 1975 and 1990. The art is painted in oil on masonite and the size is approximately 25 x 16. My apologies for the high price for Global Priority, but costs have risen significantly over the past months. And I've gotten a lot of good feedback about packaging. This piece of art is first sealed in a waterproof bag, then secured to several layers of foam core and industrial reinforced cardboard bound by professional packing tape.................. The item "DOUG BEEKMAN SF PAPERBACK COVER PAINTING FURY OUT OF TIME" is in sale since Thursday, December 22, 2016. This item is in the category "Collectibles\Comics\Original Comic Art\Paintings". The seller is "art_gurufunkel" and is located in Putney, Vermont. This item can be shipped to North, South, or Latin America, to all countries in Europe, to all countries in continental Asia.